Driving Ireland’s highways and byways is a feast for the eyes, as motorists pass by some magnificent works of art. I love Ireland’s roadside art displays. Some may disagree with me, considering them a distraction, but for me these motorway masterpieces add a little intrigue to every journey. Today I thought I’d share some of the shots I’ve taken over the years of Ireland’s roadside art, plus a few beauties I found online. 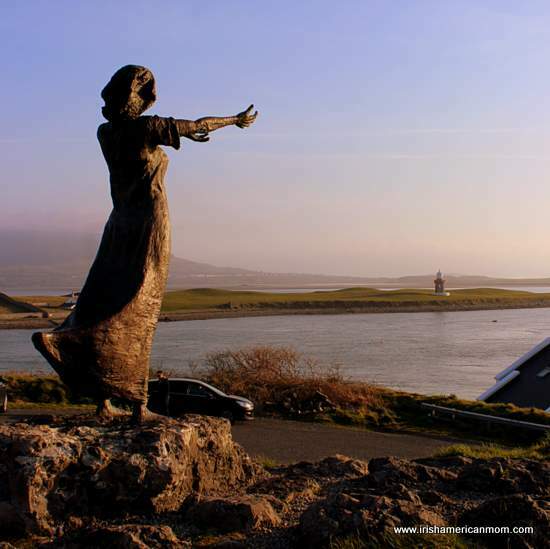 The “Waiting On Shore” sculpture above stands in Rosses Point and commands a magnificent view of Sligo Bay. A memorial to those who have lost their lives at sea, it also remembers the women who waited onshore for their loved ones to return. I captured these children playing on stilts in County Monaghan as we drove from Dublin to Donegal. Back when Ireland was expanding its road infrastructure one per cent of the cost of every new road was set aside to fund a piece of art. Many people may think this was a waste of money, but I commend the decision to support our artists. 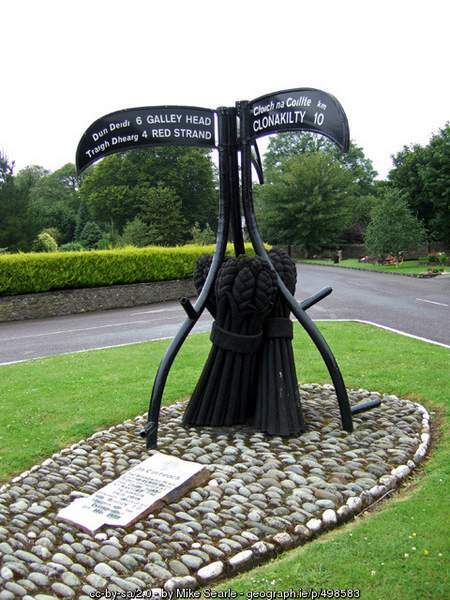 An old legend of Ireland called the Táin Bó Cúalnge (The Cattle Raid of Cooley) tells how Cúchulain killed his friend Ferdia in the most famous fight in the battles between Queen Maeve of Connacht and the Men of Ulster over a magnificent Ulster bull. Ardee is near the location of this fight between friends that could only end badly. I took this photo near Lough Key in County Roscommon. 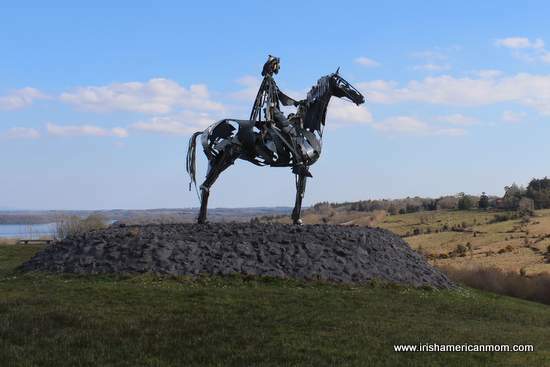 This “Gaelic Chieftan” overlooks the site of the battlefield where in 1599 the Irish chieftan Red Hugh O’Donnell fought and routed the English forces led by Sir Conyers Clifford. Red Hugh sits high upon his horse today gazing down upon the lake and the road. As you drive north with your car climbing the inclines towards the Curlew mountains, it seems as if Red Hugh is bidding you a safe journey through Curlew Pass. Now not all Irish roadside art poignantly retells sad stories from days gone by. 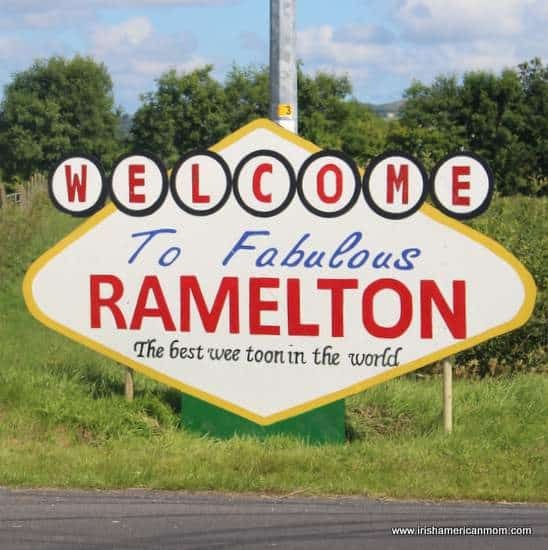 This sign welcomes one and all to fabulous Ramelton in County Donegal. Well, that’s what the band Goats Don’t Shave love to sing about. 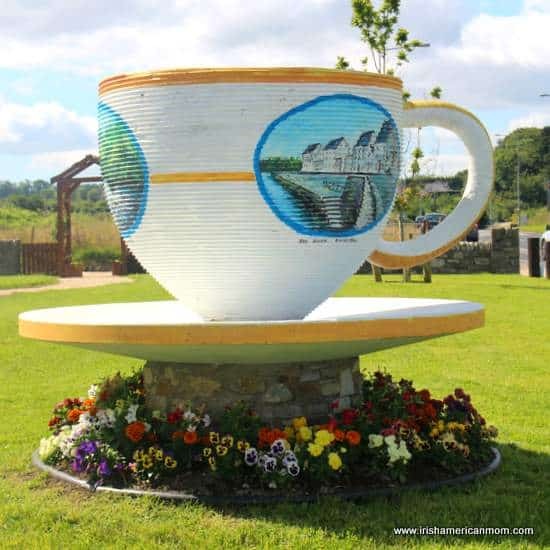 And anywhere you may roam in Ireland, you’ll always find a grand cuppa tea waiting for you, like this one in Ramelton. It matches the Las Vegas sign, but I dare say there aren’t too many cuppas served in the real Las Vegas. 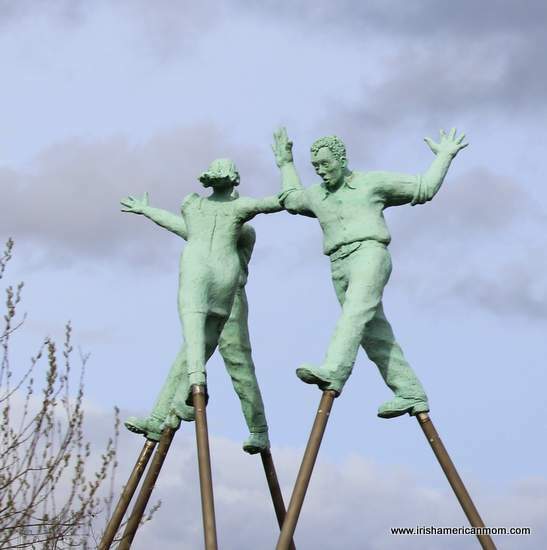 These two dancers are part of a group of five huge steel sculptures lovingly knows as “The Tinnies” to the locals in Strabane, County Tyrone. There’s a fiddler, a flautist and a drummer to make music for the dancers. When Tyrone are playing in important GAA matches the Tinnies are dressed in the Tyrone colors of red and white. My kids love to see the Tinnies on the Lifford roundabout. They signal we are on the last leg of our journey from Dublin to Letterkenny. 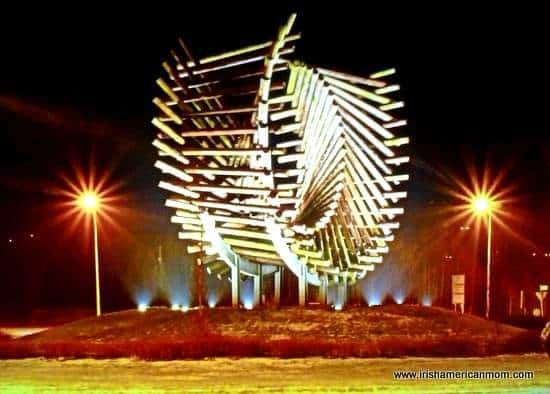 And how about this beauty on the Polestar roundabout in Letterkenny. It reminds me of a leaping salmon, and looks stunning at night. 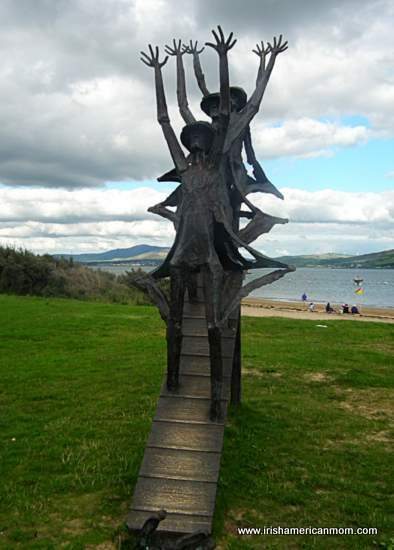 This piece in Rathmullan, County Donegal commemorates the Flight of the Earls from this very beach in 1607. 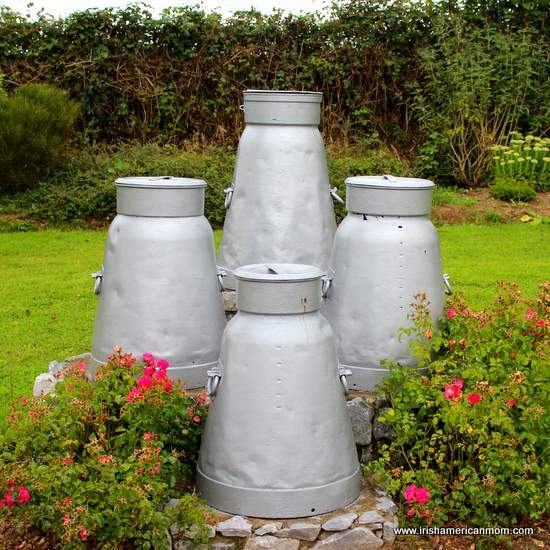 Four old farm churns greet those arriving and passing through Kildorrery, County Cork, proving roadside art does not have to be expensive, commissioned sculptures. Old farm machinery and churns like these are a beautiful way to recognize our rural past. This beautiful piece, near Castlefreke in County Cork, serves as a functional road sign, but can definitely be classified as a work of art. It’s called “The Winnowing Place,” aptly named because many years ago these crossroads were a hive of activity at harvest time. And these birds are about to take flight from their rookery in County Leitrim. Their nest is located beside the roadside picnic area immediately south of Drumkeeran. Don’t worry your food is safe from these birds, unlike some of the seagulls you may encounter along Ireland’s coast. © Copyright Ian Paterson and licensed for reuse under Creative Commons License. 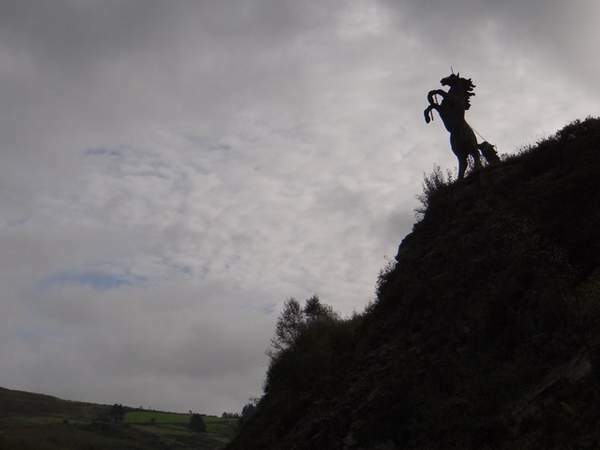 This rearing horse can be found near Clydagh Bridge in the Cork and Kerry mountains. What a magnificent sight he is at dusk. I hope you enjoyed today’s little sampling of Irish roadside art. 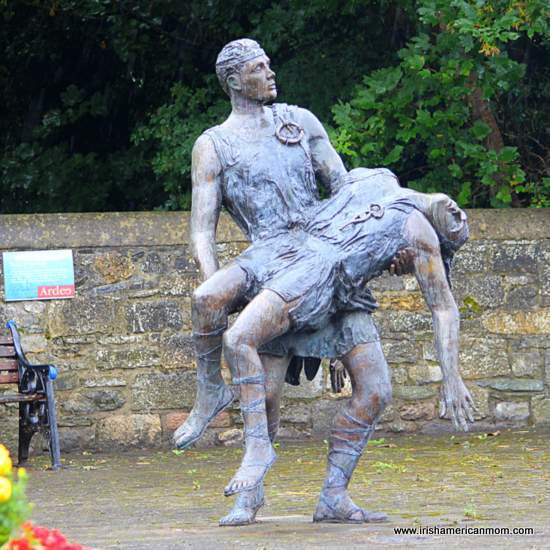 Let me know if there’s a piece of public Irish artwork you especially love. Please feel free to share your thoughts on these motorway masterpieces and roadway reliefs in the comment section below. I hope, as Ireland’s economy strengthens, more roadside art will be commissioned in years to come. Unfortunately I didn’t see any of these beautiful works! We were a little yay remembering to drive on the opposite side of the road, and carrying all the fushia petals on our car, LOL. Hi Pat – I never thought about these sculptures being a distraction to drivers trying to focus on staying on the left side of the road. It does take some concentration when you first arrive in Ireland. I find I have no problem reverting back to driving on the left when I’m in Dublin. I learned to drive in Ireland so I can only picture myself driving on the left. However, when I first return to America from Ireland I’m dangerous in parking lots. I have a terrible tendency of reversing out of my parking spot and pulling to the left. This was such a great post. Thanks so much for sharing your photos with us. Thanks for checking them out Pat. I’m glad you enjoyed this little snapshot of Irish roadside artworks. I half expected the sign for Ramelton to read Ballykissangel! It looks like something the TV town’s scheming businessman Quigley would have had his two flunkees create! So true, Patricia. I loved watching BallyK … sounds like you were an avid fan too. And let’s face it … every work of art doesn’t have to be a masterpiece. This “fabulous” sign is testament to the Irish sense of humor. OMG!! I love that show, so sad it ended but it was totally a great tv show ? Hi Kelly – Seems many of us were fans of Ballykissangel. A brilliant show indeed. 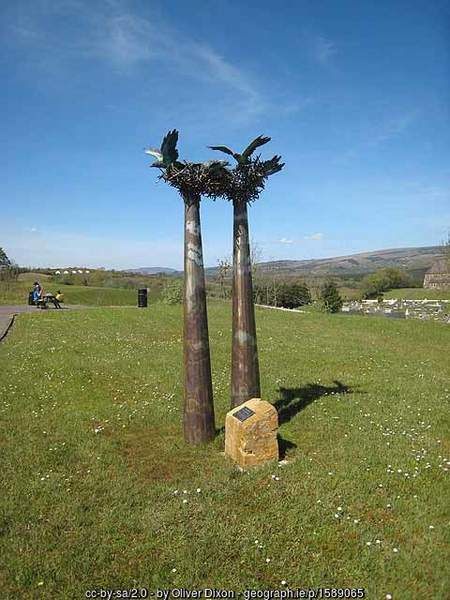 Hi Kelly – I believe there are over 1500 sculptures dotted around Ireland, with many more in the six counties of Northern Ireland. You’ll need to take many trips to Ireland to see them all. 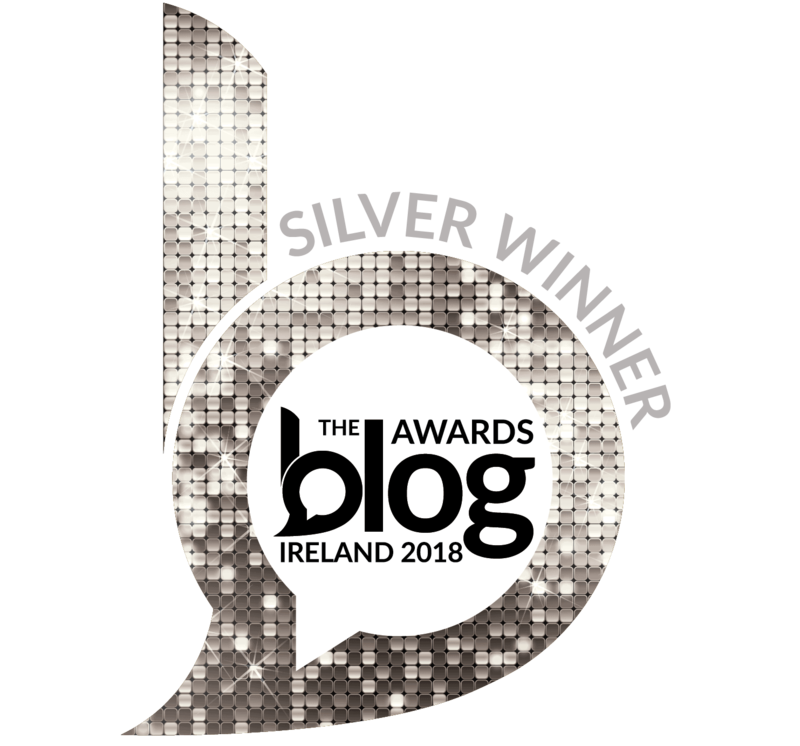 As I find more photos with a creative commons license that I can share on my blog, I’ll create more posts to spread the word about Ireland’s beautiful artwork. Best of luck with planning your trip, and I hope Ireland will be all that you dreamed it might be. Thank you so much for sharing those beautiful pictures. 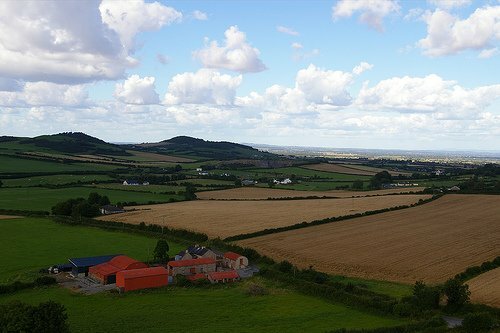 I know that I will never get to Ireland, so it is really nice to see just amazing picture and learn about Ireland. Thanks again. Looking forward to your next posting? 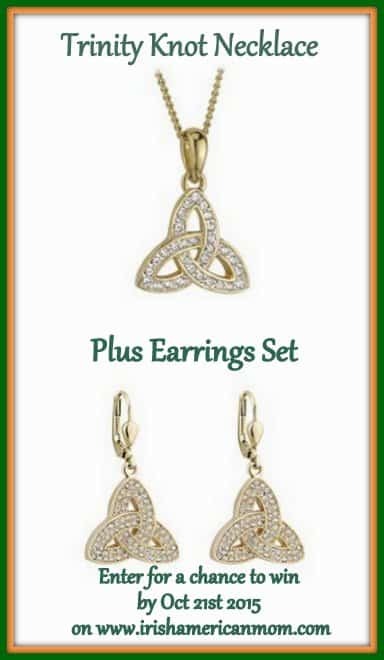 Hi Sharon – I’m so happy I can bring a little bit of Ireland to you through my blog. Thanks so much for checking out my posts. 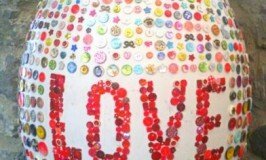 Hi Mairéad, thank you so much for your posts! I really enjoy them. 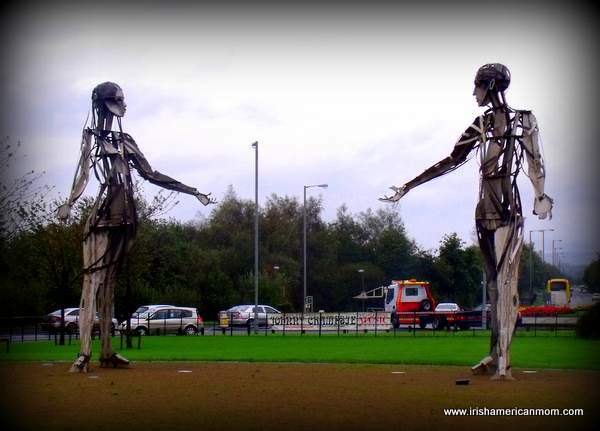 For a different type of roadside sculpture, check out Ballaghaderreen bypass. I like them a lot. Totally enjoyed looking at those photos. Thanks for Sharing! Hi Claire – I’m delighted you enjoyed this little introduction to some of Ireland’s public artwork. I love turning a corner in a road only to behold an unexpected piece of art. It’s easier to appreciate them as a passenger, than a driver. This post was such a treat, what a great idea to share your lovely photos, thanks, Mairead. It made me happy to read that a portion of taxes were set aside for the express purpose of creating road art. Ireland has always supported artists and writers but this was a truly inspired notion. Hi Melissa – I believe Michael D. Higgins, the current President of Ireland, was one of the main supporters and developers of this plan. Hopefully this policy will continue for years to come. I don’t know if it got scrapped in the recent recession but here’s hoping that is not the case. Mairéad, hands down my favorites are the first and last ones pictured. Love the woman waiting on shore with outstretched arms and that rearing horse is magnificent! Thanks for sharing these and giving me another glimpse into Ireland. Blessings to you in this new year! Hi Cheryl – Those two are especially spectacular. I’ve never driven past the rearing horse between Cork and Kerry, but someday I hope to see him. Best wishes to you and yours for 2016. 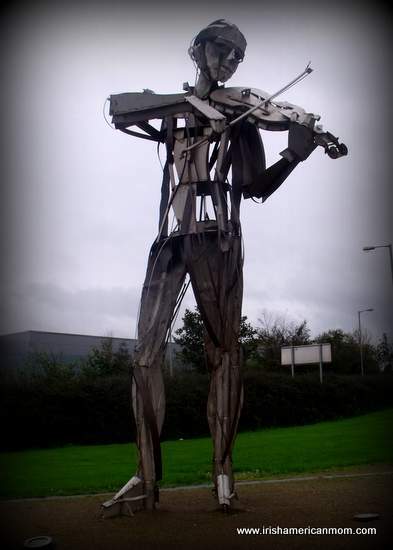 Hi Mairead, I remember seeing that interesting sculpture for the All Ireland Fleadh at Letterkenny, It was always a dilemma, should we admire the artistry or remember which way to go around the round about? Hi Brian – That Polestar roundabout is really busy in Letterkenny – definitely takes some concentration to make it around. How interesting! And great pics! Each one was fun to view and think about. I loved your historical/lore tidbits of Cuchulain*, Red Hugh O’Donnell, and the flight of the earls! 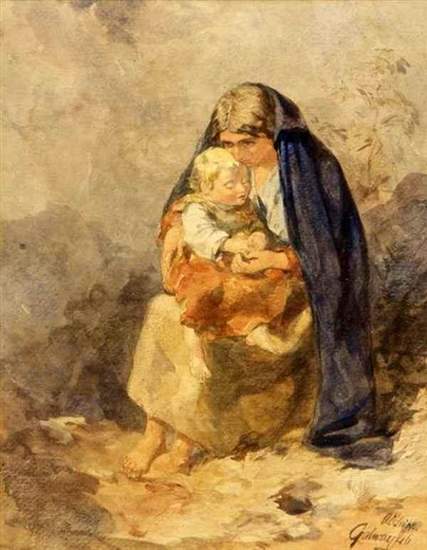 But…I have to agree with Chery…the first and the last…Waiting on shore was so moving…couldn’t help but think of my Dad, the Irish sailor (from Cobh), and the Rearing Horse darn near took my breath away…soul touching! *fada problems…I saved the wonderful outline you provided, but I obviously have not mastered the issue! But thank you so much for that! Hi Annie – The rearing horse truly is spectacular, and the sculpture in Sligo brings a tear to my eye. When the sun is setting over the Atlantic and the ocean is burnished with an orange glow it is breathtaking. I’m glad you like the artwork that is linked to old Irish legends and heroic historical figures. Thanks for stopping by, and have a lovely weekend. I greatly appreciate all the road side art in Ireland. It was a wise decision to devote a portion of the highway costs to art. I’ve stood in awe at the foot of some of these you’ve featured. Thanks for taking the time to feature something so important in this small country that we love so largely. Hi Sara – I hope that as Ireland’s economy continues to recover the government will once again allocate money for roadside works of art. I love the ones that illustrate our history, mythology and cultural heritage. I took a look at your Flickr album. Your photos of Ireland are spectacular. 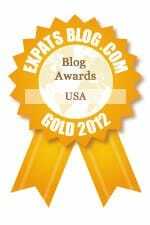 If you would ever like to feature some on my blog as a guest post, just let me know.